Do you know a high school senior interested in studying architecture, landscape architecture, planning and/or interior design? 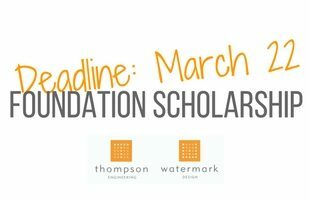 They may be eligible to apply for the 2018 Thompson Foundation Scholarship. Scholarship winners are selected based on scholastic achievement, financial need, good character, leadership qualities, community involvement and personal development. The annual $1,000 scholarship is renewable for up to four years. The Thompson Foundation scholarship is administered by the Community Foundation of South Alabama. Applicants will be asked to create an account and submit application materials at the Community Foundation of South Alabama website. The deadline to apply is March 22, 2018. The scholarship recipient will be notified in writing no later than July 2018.